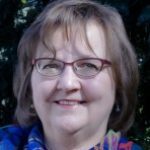 Janet Salmons is an independent researcher, writer and consultant through her company,Vision2Lead. In addition to her latest book and numerous articles and book chapters, she has written Doing Qualitative Research Online, Qualitative Online Interviews, Online Interviews in Real Time (2010), and edited the Cases in Online Interview Research (2012) for SAGE Publishing. Carrying out scholarly research is a challenge, whether you are conducting an empirical study, reviewing literature, or developing a new theory. But research is only part of the process. When you formulated the design, you thought about a need for improved understanding about people in a certain situation or better approaches to resolving an intractable problem. In whose hands should your findings be placed in order to achieve the kind of impact you had in mind? Scholars who can build on your work, test your theories, or explore subsequent questions with new populations or contexts? Academics who can teach your work to the next generation? Or, should your results be available to mayors or managers, teachers or parents– those who can use what you learned to improve the lives of individuals, organizations, and communities? If you see practical application as important, what steps should you take to translate academese into down-to-earth recommendations? Depending on your thoughts about these and other considerations, you’ll want to ponder the options for getting your research to those who can use it. At the same time, you will want to think about your own role: what can you do advance in the direction you envision, and what does all of it mean for your career? Join Dr. Helen Kara and Dr. Janet Salmons for a publication strategy Tweetchat on January 17 at 3 pm UTC. See http://bit.ly/2ikYFRZ for your time zone! No registration needed– just log on and look for #PubPlan. For many of us, publishing results is a critical next step from the completion of our research. But too often, we take what comes without reflecting fully on the best options that fit our work, and goals. We aren’t sure where to start, then see a call for papers and start working on an article. We see a call for book titles or chapters, and shoot off a proposal. We answer a friend’s request to contribute to the blog of a professional association. We create a social media presence and may be very active one month and silent when things get hectic. And they do get hectic– sometimes we wonder how and why we committed to so many projects! I’ve heard comments about these dilemmas from students, as well as from colleagues. It seemed like even skilled writers were flummoxed by the publication process. And others who successfully published articles or chapters still didn’t feel that they had accomplished what they had hoped. Looking more closely, it became apparent that while most graduate programs emphasize the need to publish, and most academic positions require publications, the space or help needed to think through the options is largely unavailable. I set about to develop some supportive solutions, including materials, webinars, and a course I offer with Dr. Helen Kara. 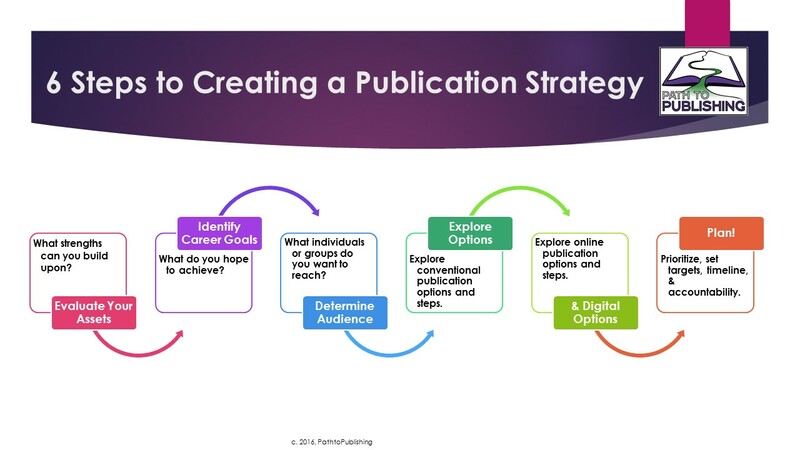 A publication strategy is a thoughtful plan of action for aligning career goals with publication options. Performing careful reflection and systematic analysis is critical in order to make purposeful use of our research findings and the new knowledge we acquired. We call this process creating a publication strategy. A publication strategy should include carefully-defined goals, a purposeful timeline, and actionable steps for proposing and writing the kinds of pieces large or small that allow others to access what we’ve learned, produce impact, and propel our careers forward. A strategic process starts with evaluation of our strengths and assets. When we critically read our dissertation or thesis, academic papers or reports, and other previous writings—what stands out? What material can we develop further and what findings can we discuss in new ways? Next, we need to reflect on our personal and career goals. Do we want to find an academic or professional job, change careers, or start a consulting practice? Depending on our goals, who do we need to reach? Who do we hope will read our publications? Based on what we learn, we need to evaluate the diverse publication options available to us, from conventional to digital– from the textbook to the self-published book, scholarly article to social media post or video series. Which options will reach our desired audiences? How do these options complement one another, and how they can be used intentionally for worthwhile outcomes? These explorations become the foundation for a do-able plan of action. Importantly, the publication strategy should also spell out a system of accountability– whether we intend to rely on self-motivation, a writing circle, or external rewards such as promotion and tenure. Of course, this is not a linear process—we may find that we circle back to reconsider different options or to add other audiences we come to realize are important. Nor is it a process that results in a fixed record —like any good plan, it should be a living document that helps you to prioritize writing projects and allocate your time effectively. If you’d like to focus on your own publication strategy with a small group of writers, facilitated by Dr. Helen Kara and Dr. Janet Salmons, consider enrolling in our online course. The next one starts February 10. See www.pathtopublishing.com for more information and registration. This entry was posted in Tips and tagged Academic Publishing, Publication Concerns, Publication Strategy. Bookmark the permalink. Post a comment or leave a trackback: Trackback URL.